The First Official Image Of Anne Hathaway As CATWOMAN In 'THE DARK KNIGHT RISES'! The official site for Christopher Nolan's Dark Knight Rises, has revealed our first & highly-anticipated look at Anne Hathaway in full costume as 'Catwoman'. Yesterday we bizarrely glimpsed a piece of her Mask, today we get the whole Suit. The Dark Knight Rises also stars Christian Bale, Joseph Gordon-Levitt, Tom Hardy, Gary Oldman, Morgan Freeman, Marion Cotillard, Josh Pence, Nestor Carbonell, Michael Caine, Alon Aboutboul, Nestor Carbonell, Matthew Modine, Tom Conti, Joey King & arrives July 20th 2012. Hit the jump to check it out in High Resolution. Overall it seems Nolan has gone for the minimal look, a very simply design & I have to say I am pretty disappointed. Catwoman is a character begging to be adulated, she is one of the few roles in the franchise whose appearance can be 'overdone', her design can be 'excessive' without the risk of falling into Joel Schumacher 'kitch' or TV show 'camp' because traditionally Selina Kyle's costume is a reflection of her flawed excessive personality. Which Tim Burton realized so well in Batman Returns, yet this is another director with his interpretation & typical 'Nolanesque' deconstruction. So what do we think? Is there too much 'control' infused in its design? Is it too similar thematically to Batman? Is she a boring Cat-Burglar? It seems so. The question can be asked, is this just an early design at an early stage in the movie, not the finished Catsuit? Well I don't think Warner would release anything if not the finished article. Click for a larger view. 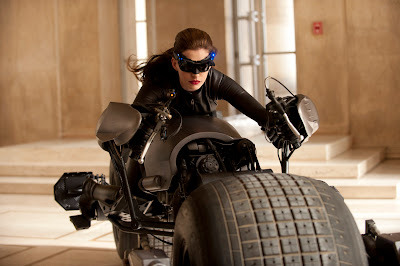 I'm reading: The First Official Image Of Anne Hathaway As CATWOMAN In 'THE DARK KNIGHT RISES'!Tweet this!